Egyptian Court Sentences Mubarak To 3 Years In Prison For Corruption : The Two-Way Deposed Egyptian president Hosni Mubarak and his sons were charged with embezzling millions of dollars in public funds. Ousted Egyptian President Hosni Mubarak, sitting in a defendants cage, waves during a court hearing Wednesday. He and two sons were sentenced to jail on corruption charges. Deposed Egyptian president Hosni Mubarak has been sentenced to three years in prison and a fine, after a court found him guilty of embezzling public money. Mubarak's sons, Alaa and Gamal, were given four-year sentences; the three were accused of using public funds to pay for work on their own property. The criminal court in Cairo ordered the three to pay a fine of nearly $3 million. "Mubarak and his sons were convicted over accusations that they used about $17 million of state money to spruce up private properties," reports NPR's Leila Fadel in Cairo. "They are also accused of falsifying documents to cover up the stolen money." 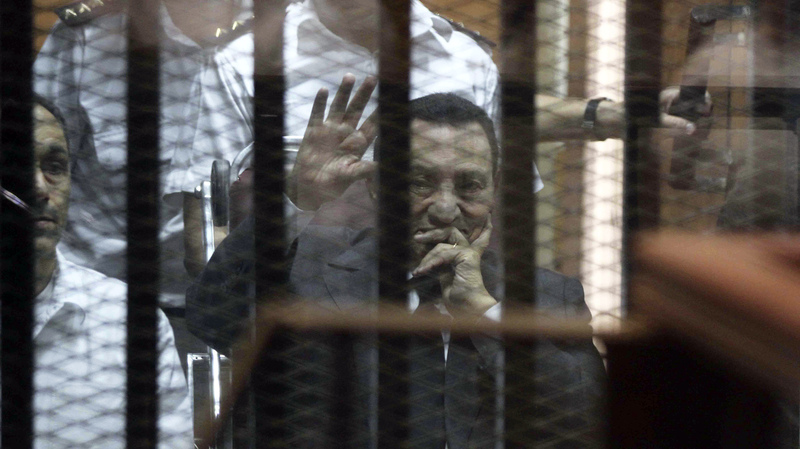 The case doesn't end Mubarak's legal troubles. Mubarak, 86, has been "under house arrest at a military hospital since August pending retrial in a case of complicity in killing protesters during the 2011 uprising that ended his rule," as Reuters reports. Egypt will hold national elections next week. Many expect Mubarak's former military intelligence chief Abdel Fattah al-Sisi, who recently resigned from his post leading the defense ministry, to win the presidency.